It’s that time of the year again – the merry holiday season that brings in cheer and jitters of the new start as well. When we think about how fast the year went past and get anxious of how we did not keep up our previous resolutions. Most of it would have been, ‘I won’t drink again’ or ‘I will hit the gym and exercise more’ or even ‘I will not work too much and strike a balance with my personal life’. We know for sure these are only going to last probably a month and not more. Read more about motorcycles: Knowledge is important and it inspires you more towards pursuing your passion, teach you tricks of the trade and keep you prepared for the unknown. Even better when it is about motorcycles, it could help you ride better by teaching you a few tricks, the best motorcyclists do while they are on road. We suggest you read “Zen and the Art of Motorcycle Maintenance”, if you haven’t already, and don’t forget to read “Jupiter’s Travels” by Ted Simon’s. Yes, this is the book that inspired Ewan McGregor and Charley Boorman to do “Long Way Round”, the TV series on their quest from London to New York on a bike. Learn to ride ‘better’: Learning is a continuous process, you never get better at it, until you have an open mind and a will to know more. There are indeed some beginner’s workshops on riding that will give you an idea as to how you could get better at riding. More often than not, you usually pick up some new tricks at such workshops, so it is worth a try. Spend more time maintaining the bike: This is one regret we bikers have all the time, ‘I wish I could spend more time maintaining my bike’, which we only realise after our bike breaks down on the road, at midnight. Not just that, learning to maintain your bike yourself, could come in handy someday when you are riding all alone, without immediate access for help. Buy more presents for the bike: ‘My bike – the love of my life, doesn’t need to be pampered’ said no one. There is no reason why you shouldn’t be pampering your bike when it has been nothing but nice to you. So go that extra mile and get that bling-y tail lamp or a fancy exhaust, it is very important to show some love. Weekends with your biker mates: Apart from the fact that riding itself is fun, riding with a bunch is even more fun. 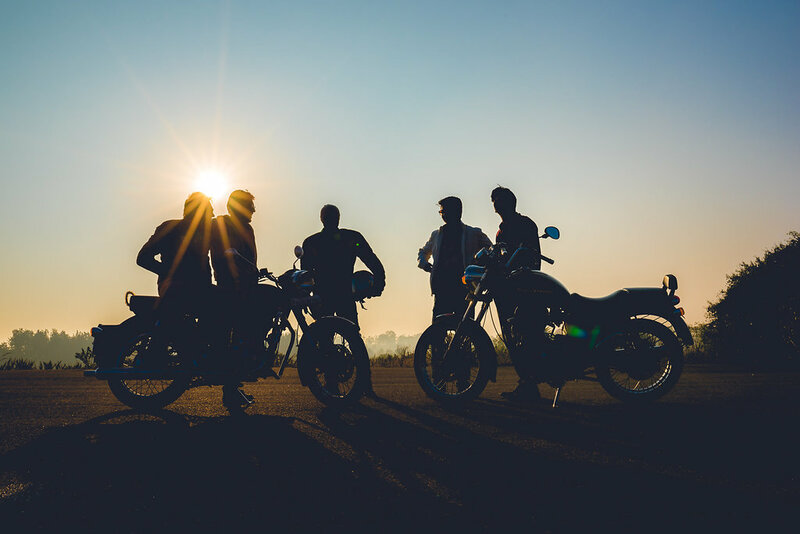 Spending more time with like-minded bikers will motivate you to pursue your passion for riding. Stop giving those excuses and just do it, go on an early morning ride just to see the birds chirping and the ray of light bringing everything around you to life and then stop for a cup of coffee, at that tuck shop to have a laugh with your biker mates. Do an overseas bike tour: We know most of y’all have done a lot of tours in the country, why not plan a bike trip abroad instead. It takes a lot of time and attention to meticulous details, but if you get your research right, it shouldn’t be a problem. One of our known just back-packed and went on a solo bike trip in Vietnam; rough terrains and unknown territory didn’t stop him and neither should it stop you. Inspire other Riders: Nothing is worth possessing, knowledge especially; for when the cheer and content is higher when it is shared. You now possess the knowledge that ‘Motorcycling is Zen’, and that riding one liberates you from earthly possessions. Reach out to the beginners and inspire them to ride more, to go out be explorers, experience the joy of travelling on two wheels and chase the wind. We hope these ‘New Year’ resolutions helped inspire that biker in you to ride more this year, it sure is worth a try. Just plan an escapade, we know for sure that the unplanned ones are always fun and that no matter what you plan sometimes things are bound to go South. Yet again, make sure you choose the rightbike so you get the thrill out of this adventure. Check out ONN Bikes with their fleet of new bikes for rent. Signing off wishing you all a Happy Holidays and a Very Happy New Year in advance. Previous Bid adieu to 2016 with one last long ride of the year! Next Ride ONN to Pondicherry this Republic Day Weekend!